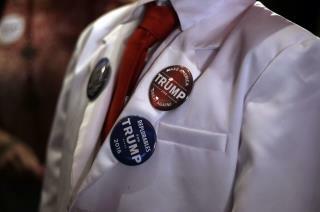 (Newser) – Divisions between supporters of President Trump and Hillary Clinton have taken a toll on plenty of relationships, reports Reuters, but this might be the most extreme example: Gayle McCormick, a 73-year-old retired prison guard in Washington state who describes herself as a "Democrat leaning toward socialist," says she decided to end her marriage of 22 years after her husband announced at a lunch with friends last year that he was planning to vote for Trump. She says it was a "deal breaker." "I was in shock," she tells People. "It was the breaking point. The Trump issue was the catalyst." "Democrat leaning towards socialist" and retired prison guard. . Kinda says it all. when you love someone nothing should tear that apart.especially politics love is forever politics change every now and then,its sad the divide over just two parties.